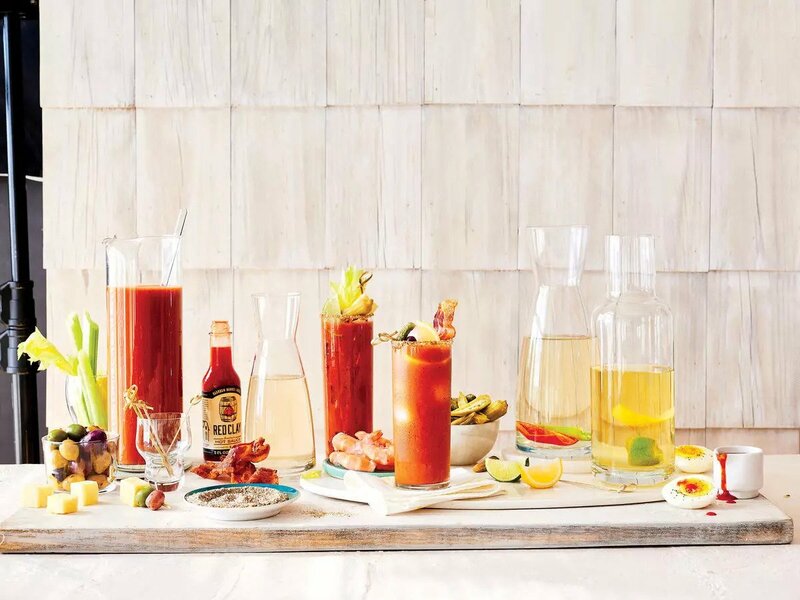 When you think of brunch cocktails, you probably imagine a fresh pitcher of mimosas or a tall, elaborately garnished Bloody Mary. You may not notice, but vodka, champagne, and other clear liquors dominate the brunch cocktail menu with nary a whiskey drink in sight. People tend to associate whiskey with heavier or stronger mixed drinks that sound too aggressive to pair with French toast and omelets. 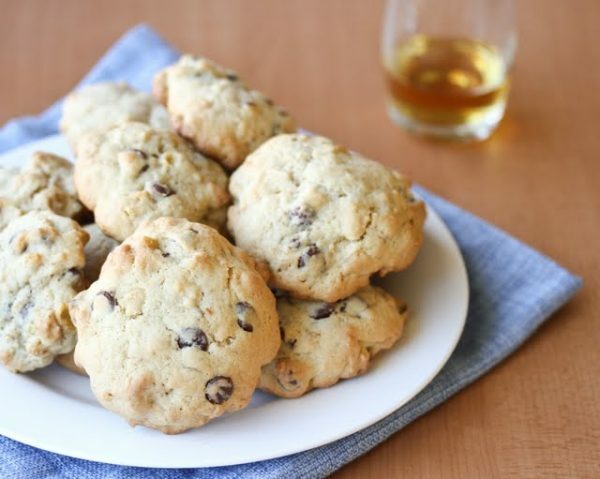 But dig a little deeper: there are a lot of ways to make light refreshing cocktails and great tasting breakfast treats with bourbon. So why not give bourbon-soaked brunch a shot? 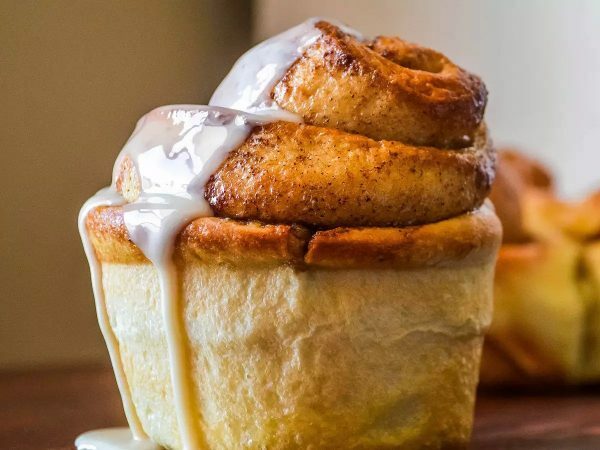 Shake things up and impress your cocktail-loving friends as you explore our twists on old favorite brunch recipes from mimosas to cinnamon rolls and much more. You don’t have to be a brunch aficionado to have a preference between Bloody Marys and Mimosas. But why waste your time arguing about which is better when you can channel that energy into crafting the next level version of each? Start with your favorite bourbon and add a slice of bacon and potato straws to make the Bloody Widow, a hearty brunch cocktail sure to make bourbon a staple of your Sunday morning drink menu. Choose your glass. Rub the rim generously with a lemon wedge. Combine French’s Fried Onions and Old Bay in a small bowl. Flip glass upside down in the bowl and coat the rim of the glass in the mixture. Set aside (in the fridge, if possible). Get two other pint glasses. Fill up one glass at least half way with ice. Pour all ingredients EXCEPT tomato juice over ice. Once all ingredients are combined, fill up the rest of the glass with tomato juice. Pour drink from one pint glass to the other until well mixed (4 or 5 times). Pour into the first glass, careful not to slosh over the coated rim. 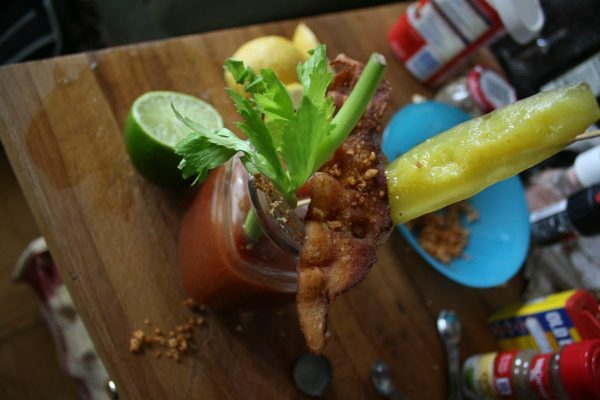 Garnish with pickle spear, celery stalk, and bacon. Never heard of pig candy? Well, you are in for a treat! 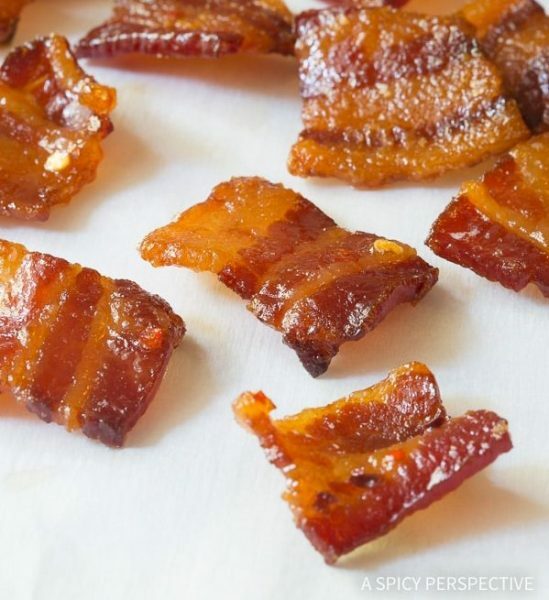 Whether you use them as a topping for salads and desserts or serve them as a brunch finger food, bourbon candied bacon will be the new star of your morning spread. 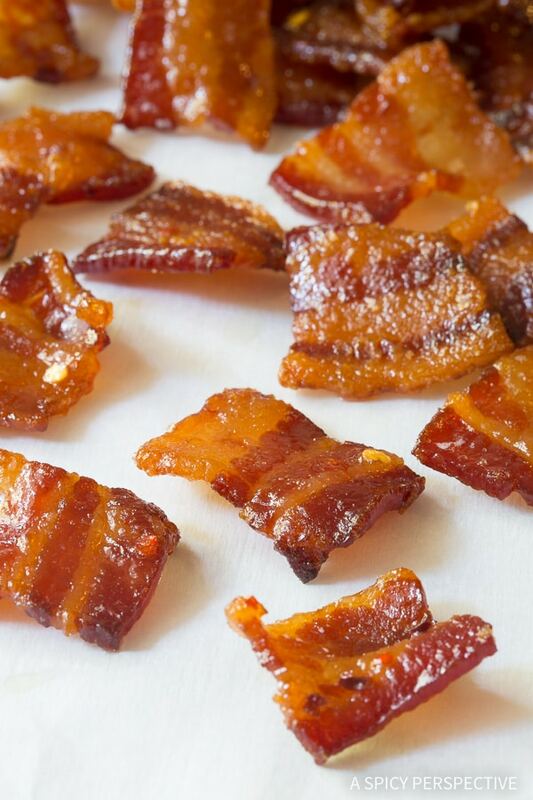 Crunchy and chewy, sweet and spicy, these delicious morsels will make you fall in love with bacon all over again. Preheat the oven to 350 degrees F. Line two large rimmed baking sheets with foil or parchment paper. Then set a wire baking rack on each sheet. Mix the brown sugar, bourbon, vanilla, and crushed red pepper in a large bowl. Cut the bacon into squares and toss it in the bourbon mixture. Mix well to coat. Place the bacon squares on the wire racks. Brush extra bourbon mixture over the bacon, saving the rest for later. Bake for 40-60 minutes, until the bacon is brick-red and crisp. The bacon will still be a little flexible while it’s hot but should quickly cool into dry pieces that are crisp on both sides. You can take a piece out of the oven and cool it to test for doneness. If Bloody Marys aren’t your thing, look no further than the Bourbon-Champagne Cocktail. People think drinking Bourbon with OJ at breakfast is a bit like driving a front-wheel drive car into the mountains. It just can’t make sense! 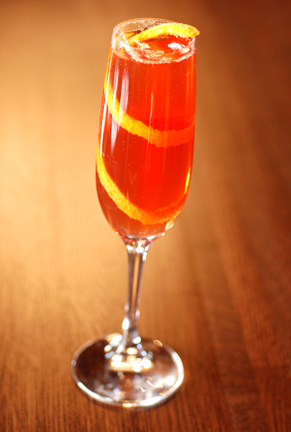 But the dreamy mixture of bourbon, bitters, orange liquor and sparkling wine in this drink will you have you wondering why you ever settled for something less with your favorite meal of the week. You can hardly ever go wrong pairing two great tasting things together, especially your favorite cold brew coffee and bourbon. With a dash of maple syrup and nutmeg, this cocktail works equally well for an early morning pick-me-up or a nightcap after a delicious meal. 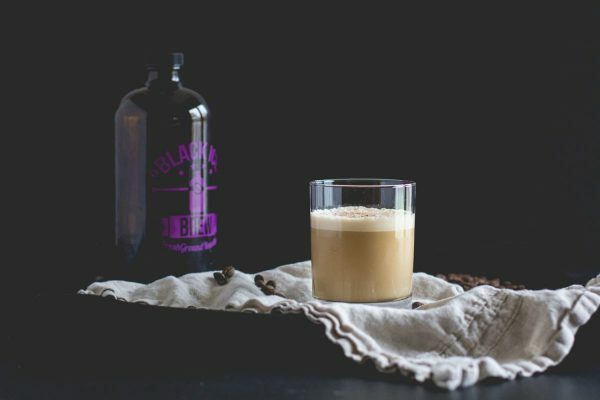 Whether you are mixing up a glass for yourself or a pitcher for friends, the Cold Brew and Bourbon Cocktail is sure to be one of your go-to drinks year round. Check out the recipe here. Add the coffee, bourbon, cream and maple syrup to a cocktail shaker (or other airtight container) with ice. Shake vigorously for about 15 seconds. Strain out the ice, pour into a glass and top with ground nutmeg. Note: If you want to make this to serve a crowd, adjust the recipe using 3 parts cold brew coffee concentrate, 2 parts bourbon, 2 parts heavy cream and 1 part maple syrup. There is nothing better than waking up to the smell of fresh, homemade cinnamon rolls wafting through the kitchen to your bedroom. Whip up an extra special batch for your special someone (or just for yourself) with a kick – bourbon vanilla icing. Take your weekend comfort food to a new high, and you will forever be known as the greatest roommate, partner and/or master of self-love in your area. Check out the recipe to find out more. In a stand mixer, combine yeast, water and 1 teaspoon of sugar and stir. Wait about 8 minutes to allow the yeast to activate. While the yeast is coming to life, gently warm the milk, maple syrup, butter, sugar and salt over low-medium heat in a saucepan until the butter has melted. In a stand mixer fitted with a paddle attachment, combine 2 1/2 cups of flour with the yeast and milk mixtures. Beat until smooth. With the mixer still running, add 4 of the 5 eggs one at a time until they incorporated into the dough. Change the paddle attachment to the dough hook, and add the remaining flour. Run the mixer for 8 – 10 minutes, until the dough ball comes together. Lightly oil a large bowl, place the dough ball in and cover with cling film. Wait for the dough to double in size (approximately 1 1/2 hours). You could also rest the dough in overnight in the fridge at this point. Once the dough has doubled in size, punch it down and place it on a floured surface. Roll the dough out into a large rectangle at 18-inch x 12-inch, about 1/2 thick. Cover the dough with softened butter, and evenly coat the top with cinnamon and brown sugar. Beginning at the 18-inch side, roll the dough into a large cigar-shaped log and pinch to seal. Cut the rolled dough into 12 even pieces. Grease two Texas-style 6 cup muffin tins with butter, place dough pieces in, and rest until doubled in size (about 45 minutes). Beat an egg and brush the tops of each bun with it. Bake for 30-35 minutes. Remove the buns from the tins and let them cool on a rack for 20 minutes. While they are cooling, combine the powdered sugar, vanilla, bourbon, and melted better in a medium-sized bowl, and whisk together. Top the cooled buns with icing. And there you have it, the next level of comfort food. The mark of a truly amazing brunch is the perfect pairing of food and drinks. But sometimes you just need to cut to the chase and address your hangover immediately, so there is always the Bourbon Brunch Cocktail: an amazingly decadent meal in a glass. 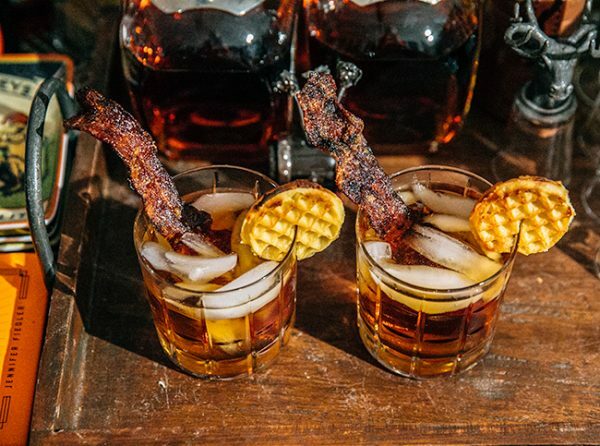 With apple cider and bourbon meeting maple syrup and ginger beer garnished with thick cut bacon and a mini waffle, you will have everything you need to start your day off right. Slit mini Eggo waffle and toast until golden brown. If you prefer chai to coffee, you can still be a part of the bourbon brunch extravaganza! 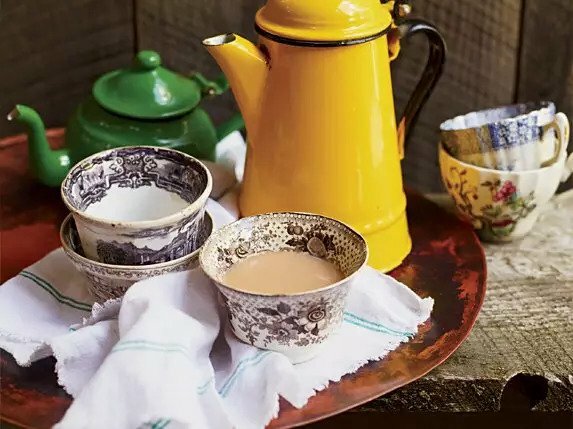 With a variety of spices to complement various bourbons, there are a million different ways to cozy up with a whiskey chai tea on a cold winter morning. Be sure to use fresh spices to bring out the flavors in your tea, and slow down as you make it to enjoy the full experience of rest and relaxation. In spice grinder, pulse all the spices to a powder. In a saucepan, bring the milk to a simmer. Remove from the heat. Add the spices, sugar and tea and let stand for 10 minutes. Strain the chai into a bowl. Wipe out the saucepan. Return the chai to the saucepan and rewarm over moderate heat. Stir in the whiskey and serve hot. Who says you can’t have cookies for breakfast? Take the classic bourbon over cereal breakfast and bake it into these delicious, cakey delights. Whether you are following the recipe with a honey-tinged bourbon or exploring your own favorite flavors, the bourbon breakfast cookies are guaranteed to change your mind about eating dessert before dinner. Preheat the oven to 375 degrees and line baking sheets with parchment paper or silpat mats. Whisk together flour, baking soda and salt in a medium-sized bowl. In a separate bowl cream the butter, sugar and the brown sugar using an electric mixer until combined. Add the eggs and the vanilla and mix on medium speed until batter is smooth. Add in the flour mixture on low-speed until combined. Add in 1 cup of the cereal (leaving 1 cup still) to the batter. Before mixing, pour bourbon directly on top of the cereal so that the flakes soak up some of the bourbon. Mix on low-speed until all of the bourbon is incorporated into the batter. Add in chocolate chips and remaining cereal and stir with wooden spoon until it is mixed into the dough. Scoop large tablespoons of dough and drop onto baking sheets about 2 inches apart. Shape dough into round circles and press down gently on the dough so that the cookies spread more when baking. Bake for about 8-10 minutes. Remove cookies from try to let them cool on wire racks. Sam Casteris is an aspiring travel writer who is hellbent on learning all she can about bourbon along the way. Her work can be seen on Transfer Ways, FreshU, and Kinja. To learn more about her, visit her writing blog, https://samcasteris.wordpress.com/. Amazing recipes! Great blog! I might mention some of your events on my blog if you don’t mind? Your cigar and bourbon pairing is excellent also! Thanks!